These capabilities and other customizations can be easily configured with configuration profiles pushed via MDM or installed locally on the computer. You must integrate Jamf Connect Login with Azure by registering Jamf Connect Login as a native application. Click the Azure Active Directory tab in the left menu. Click App registrations, and then click New application registration. Enter "Jamf Connect Login" in the Name field. Select "Native" in the Application type pop-up menu. Enter "https://127.0.0.1/jamfconnect" in the Redirect URI field. 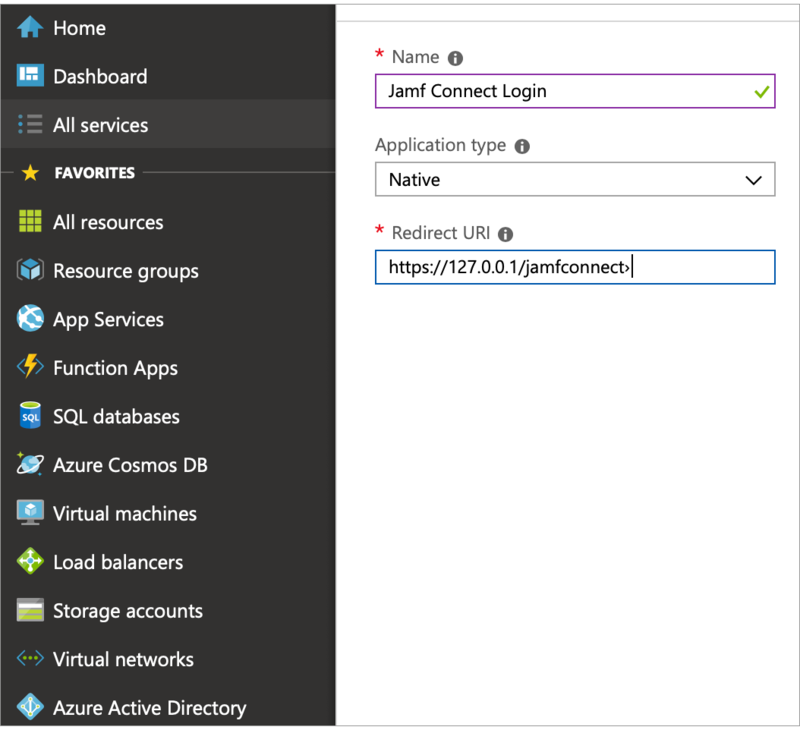 Once Jamf Connect Login is registered as a native application with Azure, you can configure settings to assign users and designate roles. Hide Jamf Connect Login from users, which limits a user's interaction with the application to the loginwindow on a computer. Grant admin consent for your organization. This can be done in the "Permissions" section of the application settings. Click App registrations, and then select Jamf Connect Login. Once saved, you can explicitly add users to the application and define roles. By default, users with the admin role will be a local admin on a system unless the CreateAdmin preference key is enabled, making all users admins. The list of roles that allow a user to be an admin can also be enabled with a preference key. To add roles to a user's Azure token, you must require User Assignment in the application properties. Note: If you are using Jamf Connect Login with automated MDM enrollment (formerly DEP), remove this application from any conditional access controls. The user will be signing into the system before conditional access can be instantiated. Jamf Connect Login is deployed with a package installer, similar to other packages installed on macOS. For more information, see the Deploying Jamf Connect Knowledge Base article. You can create a PLIST file to customize Azure Loginwindow for your organization. Note: If using Jamf Pro, you must sign this profile before uploading. The attribute in the user's SAML ID token used to determine if they are an admin user or not. The user follows on-screen steps to complete Apple's Setup Assistant, and the computer is enrolled in MDM. Enter their Azure account username and passphrase. Note: The user may be prompted to authenticate using the Microsoft Authenticator app on another device. Click Local Auth at the bottom of the window, if a local account was provisioned via MDM. Create and verify a new local passphrase. Enter an already existing Azure passphrase. The user then clicks Create Account. The computer completes the setup process and loads. Open System Preferences, and then click User & Groups to verify the local account was created. Click the Directory Editor tab. Enter the local account username in the search bar in the left pane. Ensure the "NetworkUser" field contains the user's azure username. Note: When disabled, the default macOS loginwindow will appear to users. For information about integrating with OpenID Connect see the Integrating OpenID Connect with Jamf Connect Knowledge Base article.